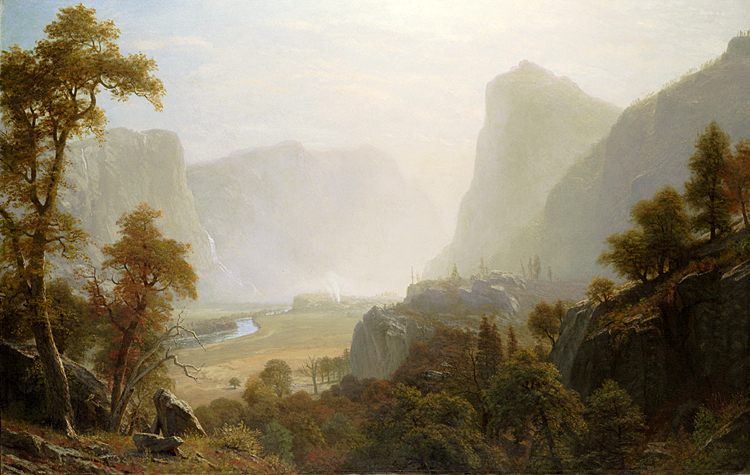 This Albert Bierstadt painting of Hetch Hetchy Valley in California's Yosemite National Park is a reminder of a past lost nearly a century ago. Today, the oak trees, the meadow, and the canyon walls up to the level of the base of Wapamma Falls in the left center of the picture are under water, submerged in Hetch Hetchy Reservoir (roll your mouse over the picture). O'Shaughnessey Dam at the head of the valley was completed in 1923 - the center piece of the water and power system of the city of San Francisco. The valley pictured above bears a remarkable resemblance to Yosemite Valley twenty miles to the south. It is roughly the same length (about seven miles), but only about half as wide. The granite cliffs are not as high, but ask about the cliff to the left of the falls and many visitors to Yosemite will respond that it is obviously a picture of El Capitan. In fact, Hetch Hetchy Valley was a part of the new Yosemite National Park when Congress approved the Raker Act in 1913. With President Wilson's signature the act became law following more than a decade of controversy giving San Francisco the right to build the dam and flood the valley. The battle to dam Hetch Hetchy was national in scope and pitted two sides of the country's new conservation movement against one another. Preservationists, led by John Muir, argued against the dam and for the sanctity of the valley in religious terms and with religious conviction. Utilitarians, led by Gifford Pinchot, creator of the nation's Forest Service, argued for the dam and for careful stewardship of the nation's resources in order to gain the greatest good for the greatest number. The battle for Hetch Hetchy did not end a century ago, however. It has been renewed. Efforts are underway today by preservationists, the state of California, and the federal government to explore the feasibility of removing the dam and restoring the valley. The materials in this unit allow you to explore over a century of American ideas about the natural environment, the geology and geography of Hetch Hetchy Valley, its early history, the controversy to dam Hetch Hetchy, and, finally, to examine the impact of breaching the dam today. Rick Thomas, "Hetch Hetchy Reservoir", 2008.